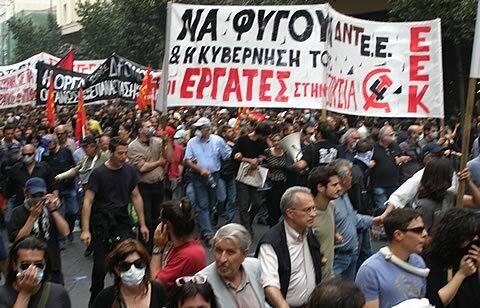 As the Greek Parliament prepares to vote for the IMF/EU program of draconian measures, hoping to save capitalism in its bankruptcy, the Greek working class and popular masses are mobilized to fight back. The General Strike of May the 5th was a great success- and just a beginning. More than 300 thousand people demonstrated in Athens on the day of the General Strike. This was one of the biggest demonstrations ever seen in the Greek capital, comparable only with the mobilizations immediately after the collapse of the military dictatorship in 1974. Despite the divisions within the workers’ movement, all the streets and public space from Syntagma Square to Omonia Square and up to Alexandras Avenue were packed by masses of people, organized and non organized. Specifically, the PASOK-controlled national trade union federations, GSEE and ADEDY, called for a rally in Alexandras Avenue; the PAME, the Communist Party trade union faction called for a rally in Syntagma Square; while the extra-parliamentary left and the anarchists called for rallies in front of Athens Polytechnic. When the PAME gathering was ended and the KKE (Communist Party) followers started to disperse, the other contingents from the Polytechnic had not even started their own march. Thousands of non organized, angry people tried to invade and occupy the Parliament shouting “Liars! Thieves! We will not pay for your thefts!” The riot police attacked the crowd. Within the parliament, which was in session, the leader of the far right party Karatzaferis falsely accused the Communist Party of this attack on parliament. The KKE leadership, in reply, accused him of being an agent provocateur, but also denounced as “a provocation” attempts by the people to occupy the Parliament. The demonstration had started to turn into a popular rebellion that the riot police had enormous difficulties to control, despite its brutality and the tons of tear gas thrown against the demonstrators. The specter of the December 2008 revolt, haunting the bourgeoisie the last two years, has returned. Unfortunately, a tragic incident – the death of three employees trapped in a bank fire started by Molotov cocktails – gave the government, State repression forces, and all bourgeois parties an opportunity to slander and repel the mass movement. Powerful demonstrations also took place in Thessalonica, and all major cites of the country. No propaganda tricks of the capitalists and their mass media can stop the growing popular anger fed by an unprecedented crisis, a systemic bankruptcy that the capitalist want to make us, the working and unemployed people, to pay for them. We will not pay for the capitalist thieves! Repudiation of the debt to the international brigands! Out with the IMF, the European Union of big capital and their PASOK government of lackeys! For an indefinite General Strike to open the road for workers’ power and Socialism! We call the entire international and European working class to join us in solidarity in our common struggle. For an international socialist way out from the bankruptcy of the capitalist system threatening to bury us under its ruins!